Yum, yum yum! This is mighty good. Drop a dash of olive oil into a frying pan and heat. Throw in your handful of cashew nuts and toast on a medium heat. Add your small knob of butter (I use olive butter to minimise dairy intake) and a generous pinch of salt. When the cashews are golden-brown, remove them to a bowl. Try not to eat them while finishing the cooking – they are dangerously delicious! Without adding further oil or butter to the pan, heat up your broccoli, so that it turns a deep bright green. When it is threatening to brown in places, add the chilli, garlic and ginger. While those are gently frying, cook your soba noodles as packet states. 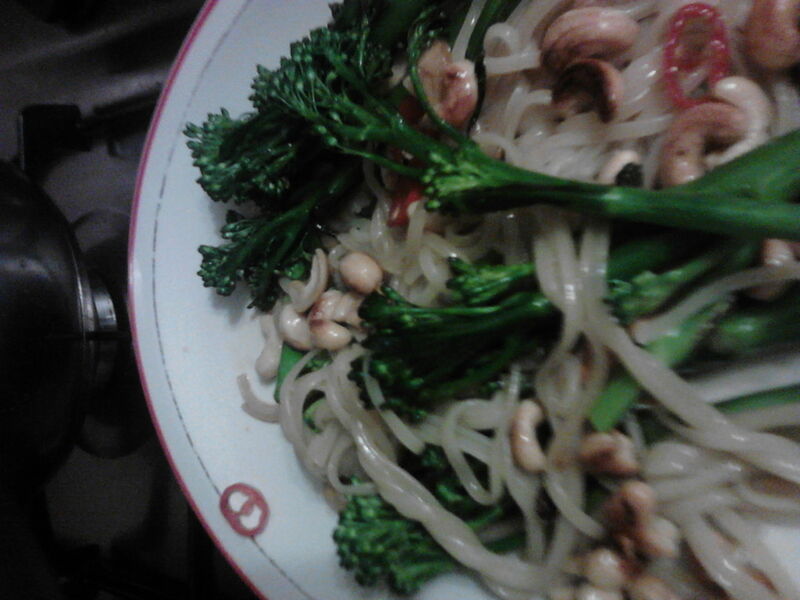 While the noodles are cooking, add your 2 tablespoons of tamari to the broccolli, chilli, garlic and ginger. Also add agave nectar. Toss so contents of pan are coated. Switch off the heat. When your noodles are cooked, transfer them to bowl or plate. Pile the contents of frying pan on top of the noodles and then scatter your cashews over and squeeze a bit of fresh lemon juice on top. I challenge you not to become addicted!